1. From the airport drive straight ahead to the 2nd traffic light and turn left onto Hana Highway #36 and head east towards Paia. 2. Continue through Paia on the Hana Highway for just over a mile. 3. Take the next left beside the store onto Kaimao Street. 1. Parking: Turn immediately to the left into the parking area close to the utility sheds. Make sure you allow room for other cars to come in and out of the property but also not too close to the shed! If you have a 2nd vehicle, please look at the parking map in the cottage so that the 2nd car is in the correct parking space for the cottage. 2. The Menehune Cottage is the pink building on the left side of the garage. Follow the pavers across the lawn and turn to the left to find the front porch and patio area. There is an outside light switch beside the front door on the right. 3. Keys: The lock box for the key is on the R side of the front door. Remember the code and please replace that key in the lock box for emergencies and use the other keys left for you inside the cottage. 4 . Information: Inside the cottage you will find a How To book with useful and important information about the cottage and the area. 1. Parking: Turn in to the R and park on the right hand side of the property behind the bamboo fence leaving plenty of room for other cars to come and go. If you have more than one car, please look at the parking map inside the house that indicates the designated parking areas for the house. 2. 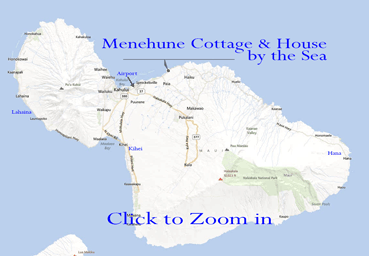 The Menehune House is the building on the right side of the garage. Follow the path between the garage and the house towards the patio area and you will reach the steps leading to the front door. 3. Keys: The key will be in a lock box, you will have the details in your arrival letter. Remember the code and please replace these keys in the lockbox for emergencies and use the other keys left for you inside the house. 4 . Information: Inside the house you will find a How To book with useful and important information about the house and the area. Once you have made the turn onto Lana Street look across to your right and you will see the orange lantern on the top of the bamboo fence to help guide you in. When you turn into your parking space the automatic lights will be illuminated which makes it easy to find you way to either the cottage or the house. It is always a good idea to carry a small flashlight with you, just in case! !